Restenosis, and in particular in-stent restenosis, remains a problem that significantly affects mid- and long-term outcome of all endovascular procedures, and especially procedures that involve the superficial femoral and popliteal artery. This chapter will provide a description of the process of (in-stent) restenosis with special attention to the histopathological changes that occur. Furthermore it will give an overview of the current status of drug-eluting balloon technology. It will describe the technique of the treatment of in-stent restenosis of the infrainguinal arteries, using a combined technique of laser debulking (atherectomy) followed by drug-eluting balloon angioplasty. Personal experience as well as the results of this technique as described in the literature will be discussed. A comparison with other techniques such as drug-eluting balloon angioplasty as stand-alone therapy or mechanical atherectomy as single therapy will be made. It is concluded that in the treatment of in-stent restenosis, debulking is probably key. 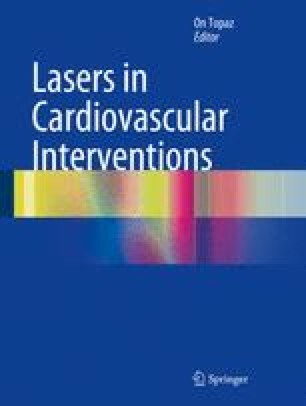 There is a growing body of evidence that by adding drug-eluting balloon angioplasty to debulking results can be achieved that compare favorable to those described in the literature that were obtained with standard balloon angioplasty, cutting-balloon angioplasty or debulking alone.